Comprehensive Chess Endings is a five volume master work by one of the world's leading authorities on the Chess Endgames, Grandmaster Yuri Averbakh. Grandmaster Averbakh is now the World's Oldest Grandmaster. He was born on February 8, 1922. He is now 90 years old and is still active in chess. This series was originally published in Russian. Ishi Press has published the Russian Language version of volume 2. That is Averbakh Chess Endings Bishop against Knight, Rook against Minor Pieces ISBN 4871875024. We will try to reprint the other volumes if we can ever find them, as they are difficult to obtain. These English versions are direct translation from the Russian except that the order of the volumes has been changed. The contents are exactly the same, other than the translation from Russian to English. These volumes in this series were first published in the Soviet Union in 1954 with a blue hard cover. It was reprinted with modifications in 1981-1983 with a soft orange cover. This is the third reprinting of the English translations. It was previously published in English by Batsford in 1975-1977 and by Pergammon in 1981-3. Each time, the order of the volumes has been changed. 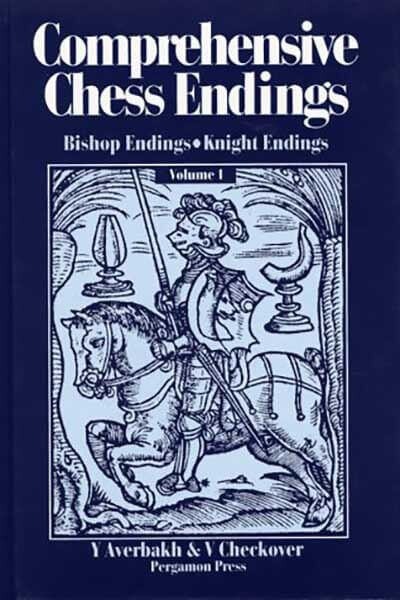 Here we are following this order: Comprehensive Chess Endings, Volume 1, Bishop Endings, Knight Endings ISBN 4871875032 Comprehensive Chess Endings, Volume 2, Bishop Against Knight Endings, Rook Against Minor Piece Endings ISBN 4871875040 Comprehensive Chess Endings, Volume 3, Queen and Pawn Endings Queen Against Rook Endings Queen Against Minor Piece Endings ISBN 4871875059 Comprehensive Chess Endings, Volume 4, Pawn Endings ISBN 4871875067 Comprehensive Chess Endings, Volume 5, Rook Endings ISBN 4871875075 An earlier series of the same books had a different order. There the order was 1: pawn endings 2: bishop and knight endings 3: bishop vs knight; rook vs minor pieces 4: rook endings 5: queens endings. Because of the popularity of these books, they have become rare and difficult to obtain. After a worldwide search we still have not been able to obtain a copy of volume 5. We had even began to suspect that it was a phantom book, a book that had been planned and announced but never actually published, but we have been assured that it does exist. Even the Russian language original editions of this book are difficult to obtain, although 100,000 were printed.